In the 2008 NFL draft, eight left tackles were selected in the first round. That’s some big money for some very big men. The right-handed quarterbacks whose blindside they would eventually protect would argue that it was money well spent. 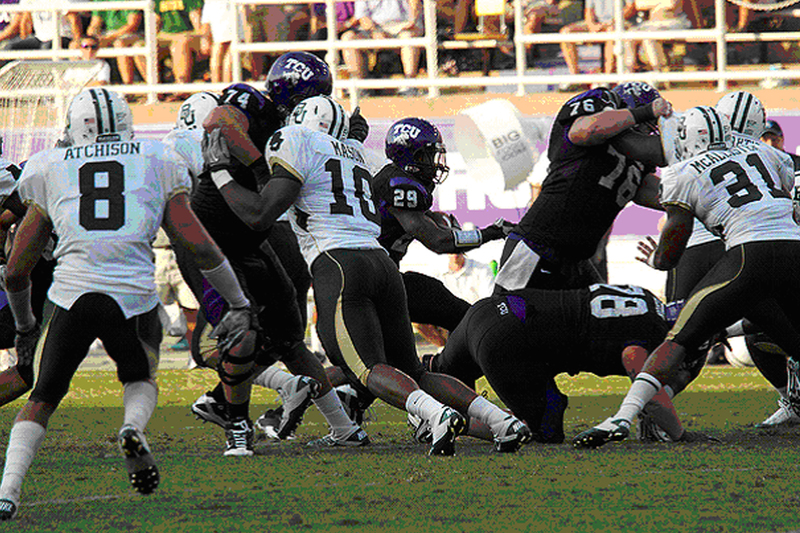 In the picture above, #76 (dark jersey) is the left offensive tackle who is protecting the quarterback’s blindside (#8) – the side he cannot see – from a defensive player’s “pass rush” from off the “edge”. But football has changed. The advent of wide-open, quick-strike passing attacks have altered perceptions and, in many cases, reality. 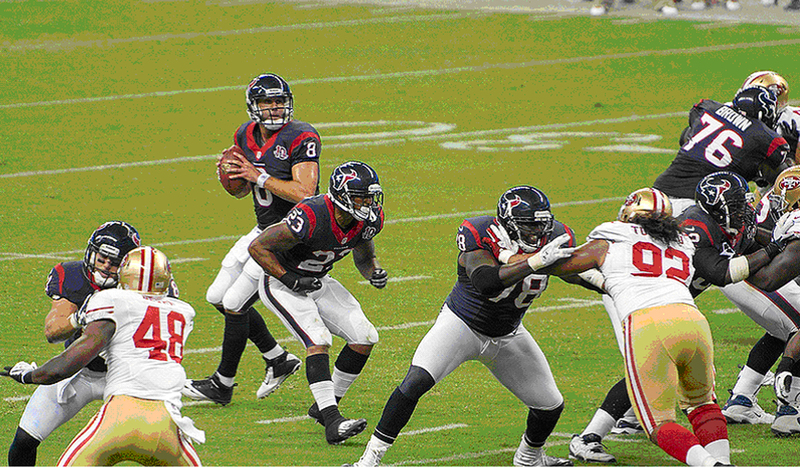 In spread offenses, the ball is coming out faster. Instead of three or more seconds, quarterbacks are getting their passes out in about two seconds. That’s not enough time for a pass rush coming off the edge to pressure a quarterback, let along sack them. As a consequence, offensive linemen don’t need to hold their blocks as long as before and the need for a great and dominant left tackle to protect a right-handed quarterback’s backside from assault has diminished. 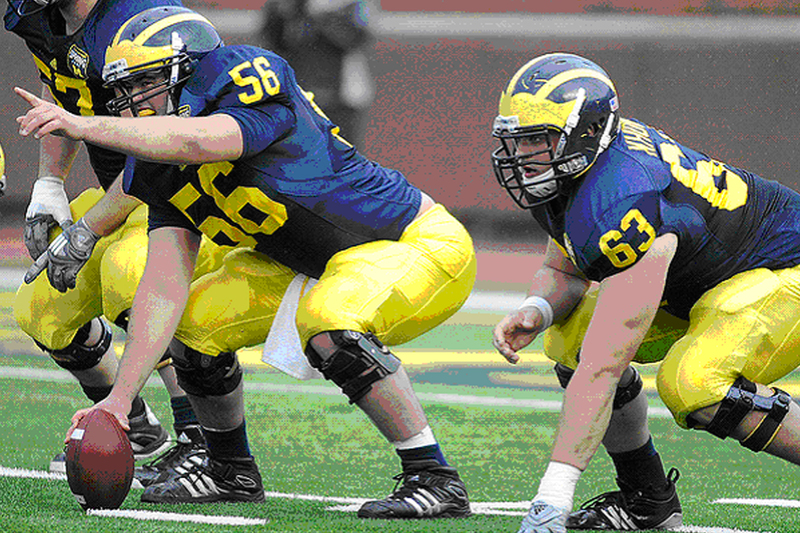 That need has now switched to the center of the offensive line. Instead of slow-developing looping stunts that are designed to confuse the offensive line, defenses now attack in much quicker straight lines and in the shortest distance available: up the middle. The idea is to get in the quarterback’s face as fast as possible. As a result, the designation, “most valuable lineman”, has shifted from the left tackle to the maulers in the middle: the center and the two guards. 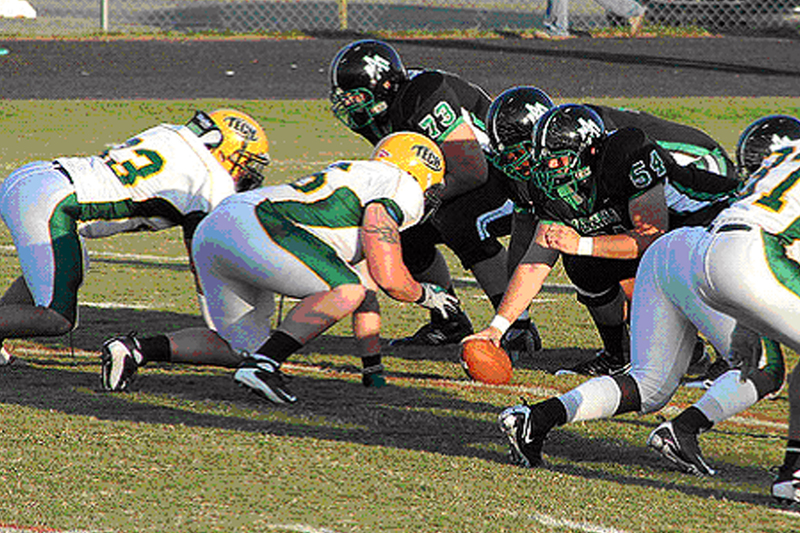 Instead of the blindside, they protect a quarterback’s frontside. In fact, it is now generally agreed that, because of the multiple roles he plays, the most valuable offensive lineman is the player at the heart of the line: the center. In a precision spread attack, he is routinely asked to make a shotgun snap while simultaneously blocking a fast and powerful nose tackle who is lined up inches from his face and exploding into him on the movement of the ball. In the picture above, the center is the player (dark jersey) handling the ball. The nose tackle is the defensive lineman opposite him. Notice how close the nose tackle aligns to the ball. 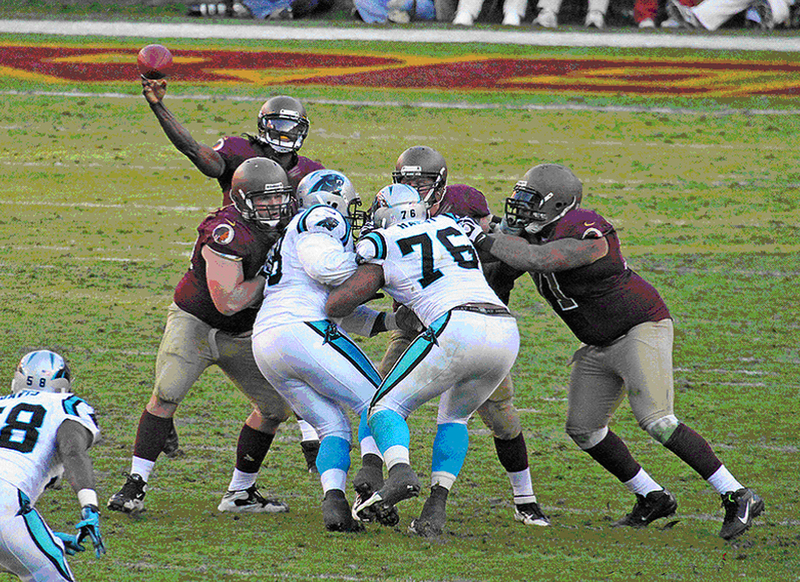 The center must snap the ball shotgun-style to the quarterback and, at the same time, engage and block the nose tackle. But in addition to the speed and strength he needs to perform his physical duties, the center also has to be smart. Real smart. Prior to every snap, he analyzes the defensive front and decides what blocking scheme the offensive line will use to defeat their attack. Before each play you will see him pointing to the defense. 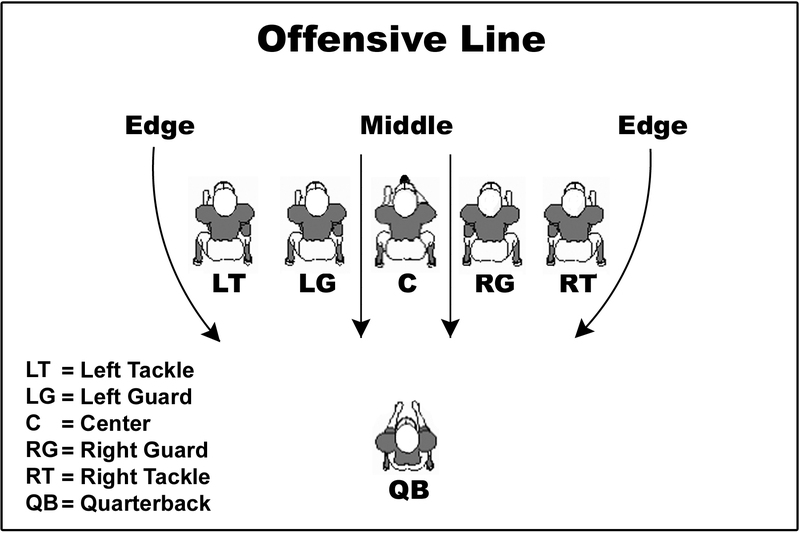 Most often he is identifying who is the middle linebacker and based on that defender’s position, the center is making the “line call”. If he’s wrong, the play can get blown up or, worse, someone, like the quarterback, can be injured. There was a time not too long ago when all eyes were focused on the battle between the left tackle and the edge defender rushing from that side. It’s still a critical match up. People still want to see the quarterback get “blindsided”. Anymore, though, your attention should be turned to the center of the offensive line, to the player hunkered down behind the ball. That’s where the action is; where many games are decided; there in the middle of the line.